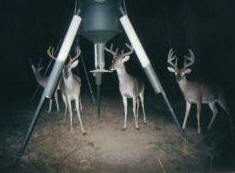 It’s the time of year to start filling your deer feeders and stalking that big buck of your choice. With that in mind, I’ve come across an article from the Noble Foundation that helps you calculate the live weight of your deer from your field dressed weight. The article is here. It is compiled from 19 years of data gathered from Southern Oklahoma and North Central Texas deer, so it should be very meaningful for local hunters. To make things even easier, they have created a calculator at the following link: Deer Weight Converter.